This fall migrating mockingbirds came back to town to spend the winter. The songs are pretty, and pretty confusing because mockingbirds mimic other species. For instance, this Xeno Canto recording by Joshua Stevenson has an American robin sound at 0:11. No it’s not a robin. When I walk around my neighborhood this month I hear 15 different songs but they come from only two locations. Two mockingbirds are “dueling” from opposite sides of Magee Field, the only birds singing in November. 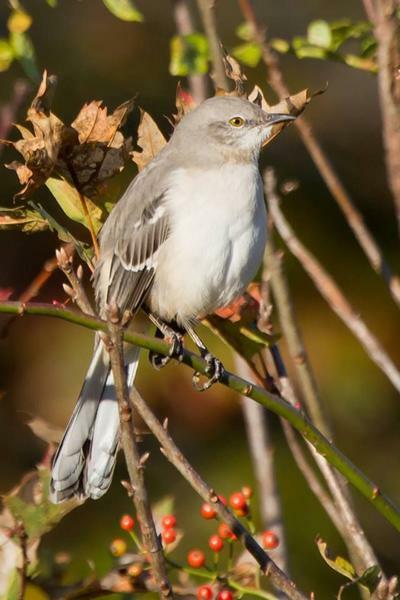 Read how mockingbirds create The Voice of a Crowd in this vintage article from 2010. Carolina Wren is another winter singer around Pittsburgh, though it doesn’t sing as regularly as Northern Mockingbird. I’m not sure if the wrens maintain winter territories, but I wouldn’t be surprised if they do. Well, now I know. This blog post all but confirms to me that was a mockingbird. I hope he stays at my feeder for the winter! On target again Kate! As KEM noted above, I heard beautiful singing last weekend and saw a NOMO. The first time in 5 years I was able to note one on my FeederWatch survey! It’s back again today, to be counted I presume, so I came to your blog and look what I find! Of course… I should keep up to date with your blog, so I’m in the know! 🙂 thanks again for your help!